A systematic review is a synthesis that takes a systematic approach to searching, assessing, extracting and synthesizing evidence from multiple studies. Meta-analysis, meta-ethnography and realist synthesis are different types of systematic review. 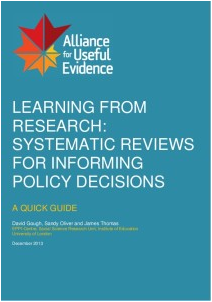 An Introduction to Systematic Reviews- this book, available for purchase, provides an overview of the nature, logic, diversity and process of undertaking systematic reviews as part of evidence informed decision making. Systematic Reviews in the Social Sciences: A Practical Guide - This book outlines the rationale and methods of systematic review, offering examples of applied practice in a variety of social science disciplines. The Campbell Collaboration - This is the website of an international research network that produces systematic reviews of the effects of social interventions. PRISMA Flow Diagram Generator: This tool, developed by PRISMA, can be used to develop a PRISMA flow diagram in order to report on systematic reviews.